We made these cards in our craft class this Saturday. Each year I try to make simple cards that can be couriered to our loved one. My inlaws, my parents all love getting cards from Lil p and they treasure her creations. Sequins in assorted colours. Big & Small. 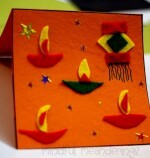 Cut out Diya shapes from the handmade paper and stick on one side of the card. 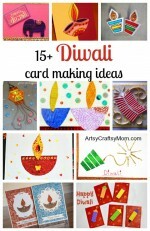 Write happy Diwali & your card is ready. Isn’t that Simple?? 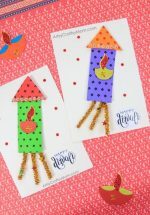 Did you make a Diwali card too? Share the links of your cards, craft ideas & celebrations.. 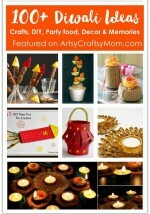 Follow Artsy Craftsy Mom’s board Diwali on Pinterest. We are so doing these. Shruti you are the best. yay! I hope the twins like making them 🙂 Share pics..
btw..the new look of the blog is cool !! We made the cards Shruti.. and their friends loved them (so did the moms). Take a look..